The International Volunteer Day for Economic and Social Development (5 December), more commonly referred to as International Volunteer Day (IVD), is an international observance mandated by the UN General Assembly in 1985. It offers an opportunity for volunteer-involving organizations and individual volunteers to promote volunteerism, encourage governments to support volunteer efforts and recognize volunteer contributions to the achievement of the Sustainable Development Goals (SDGs) at local, national and international levels. 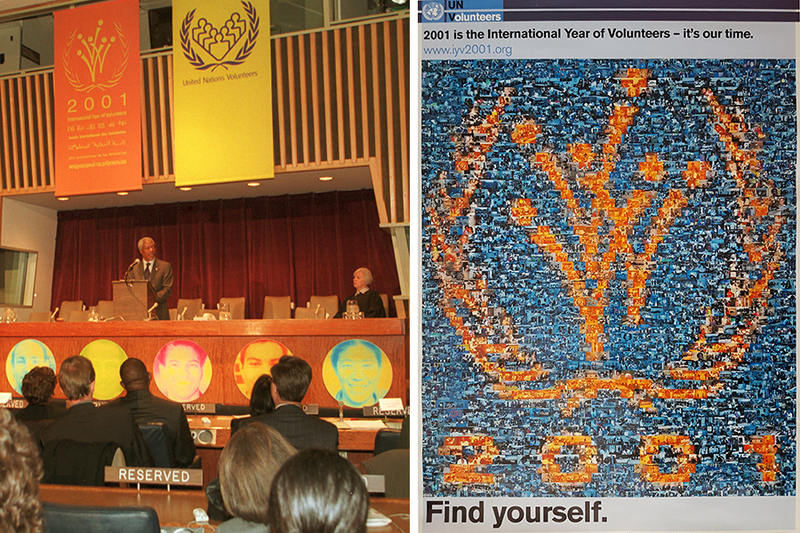 Former UN Secretary-General Kofi Annan and former UNV Executive Coordinator Sharon Capeling-Alakija marking the International Year of Volunteers 2001 at the General Assembly in New York, United States of America. International Volunteer Day is celebrated by many non-governmental organizations, civil society, and the private sector, among others. It is also marked and supported by the United Nations Volunteers (UNV) programme. UNV coordinates a campaign to promote IVD every year, building on the impact volunteers have in communities, nationally and globally for peace and development. In 2018, the focus of IVD is not only to celebrate volunteerism in all its facets, but also to highlight the role that volunteers play in building resilient communities. It is worth noting that current estimates equate the global volunteer workforce to 109 million full-time workers. About 30 per cent of volunteering that takes place formally through organizations, associations and groups; and 70 per cent occurs through informal engagement between individuals. Overall, 60 per cent of the informal volunteers are women. International Volunteer Day is a chance for individual volunteers, communities and organizations to promote their contributions to development at the local, national and international levels. By combining United Nations support with a grassroots mandate, International Volunteer Day is a unique opportunity for people and volunteer-involving organizations to work with government agencies, non-profit institutions, community groups, academia and the private sector. The International Volunteer Day for Economic and Social Development was adopted by the United Nations General Assembly through Resolution A/RES/40/212 on 17 December 1985. In 2012, in response to evolving experiences and recommendations, the United Nations Volunteers (UNV) programme spearheaded a Five-Year International Volunteer Day Strategy, with the aim to make it more globally recognized and grassroots-owned. In the last six years, IVD was celebrated each year in over 80 countries annually. The IVD website receives around 50,000 page views every year, with around 150 stories posted which highlight over 50,000 volunteers, photos and videos of celebrations worldwide. IVD 2017 – "Volunteers Act First. Here. Everywhere." The focus of IVD 2017 was to recognize the positive solidarity of volunteers around the world who answer calls in times of crisis, helping save lives today and supporting those who want to continue living their lives with dignity tomorrow. IVD 2016 – "Global Applause – give volunteers a hand"
Under this theme, IVD presented a round of global applause to celebrate volunteers everywhere and encouraged others to join in and contribute to peace and sustainable development. IVD 2015 – "Your world is changing. Are you? Volunteer!" The goal of IVD 2015 was to start a dialogue about how volunteerism is vital to the success of the Sustainable Development Goals (SDGs) and the 2030 Agenda. IVD 2014 – "Make change happen, volunteer!" During this year, IVD highlighted the contribution of volunteers in engaging people from the grassroots in decision-making processes, ultimately creating spaces for participation that lead to stronger governance, social cohesion, peace and sustainable development. IVD 2013 – "Young. Global. Active." The aim of the IVD campaign in 2013 was to pay special tribute to the contribution of youth volunteers to global peace and sustainable human development, highlighting that young people act as agents of change in their communities. IVD 2012 – "Celebrate volunteering"
The main focus of IVD 2012 was awareness of and recognition for volunteers and volunteer organizations, and hope for a better world. Through the years, International Volunteer Day has been used strategically: many countries have focused on volunteer contributions to achieving the Sustainable Development Goals, a set of time-bound targets to combat poverty, hunger, disease, health, environmental degradation and gender equality. International Volunteer Day celebrates active volunteers and attracts new volunteers in the global North and global South, with a special focus on promoting South-South cooperation. The General Assembly invited Governments to observe annually, on 5 December, the International Volunteer Day for Economic and Social Development (resolution 40/212 of 17 December 1985) and urged them to take measures to heighten awareness of the important contribution of volunteer service, thereby stimulating more people in all walks of life to offer their services as volunteers, both at home and abroad. The United Nations General Assembly, in its resolution 52/17 of 20 November 1997, proclaimed 2001 as the International Year of Volunteers (IYV). The year was conceived to further the recognition of volunteers, facilitate their work, create a communication network and promote the benefits of voluntary service. On 18 December 2008, the General Assembly decided that on or around 5 December 2011, two plenary meetings of the sixty-sixth session of the General Assembly should be devoted to the follow-up to the International Year of Volunteers and the commemoration of its tenth anniversary (resolution 63/153). Traditionally, on International Volunteer Day (5 December), UNV calls for nominations and launches the UNV Online Volunteering Award. A jury comprised of UNV representatives and external experts in volunteerism and development cooperation reviews the nominations and selects the winners. UNV invites citizens worldwide to be inspired by the winner’s stories and participate in the global voting for their favorite winner. The team that gets the most votes is announced as the public’s favorite on the International Day of Happiness. The purpose of the award is to recognize online volunteers’ contributions towards achieving the Sustainable Development Goals, to showcase the many ways in which online volunteers can strengthen the capacities of organizations and to demonstrate the difference volunteers can make to peace and development projects by sharing their time, skills and expertise over the Internet. For further information, kindly check out International Volunteer Day on Wikipedia.